Gorgonzola PDO has been the main character of two very special guided tours focussed on the history of this great Italian blue cheese. On August 25 and 26, during the event “Valsassina la Valle di Formaggi”, and again on September 9 by popular demand, the guided tour of the Parco Minerario di Cortabbio – Primaluna, in the province of Lecco, was held in order to discover the unexpected link that in the past connected Gorgonzola with barite mineral. During the first week-end over 250 visitors, in their winter jackets and boots, reached the entrance of the mine at 552 meters above sea level, in an area that is easily accessible via a municipal road. Along the approximately 2 kilometre long path, they followed the white lode mineralised with Barite, and then arrived to the majestic cave where the mineral has been mined for the last 30 years. The guided tour ended with a Gorgonzola PDO tasting offered by the Consortium and plenty of historical anecdotes that disclose the origin of the unusual link. At the beginning of the 20th century, the boom of the ripening cheese huts in Valsassina resulted in the profitable export of Gorgonzola to many foreign countries, among which Germany, France and England (here Gorgonzola was even on the Parliament menu). Barite was also mined in Valsassina, and was used for the plastering, a “second rind” to protect Gorgonzola which would become more vulnerable during transport due to the softening of the fat component. 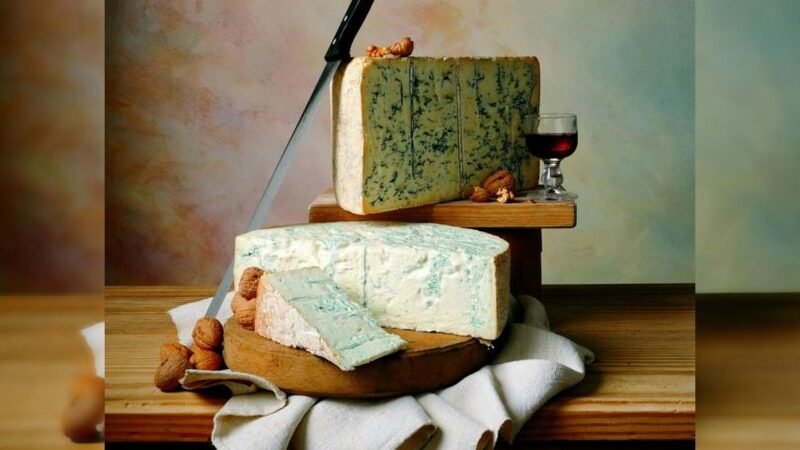 Gorgonzola was already exported earlier, as witnessed by French writers of the 18th and early 19th century, but for the shipment they would only use a plastering made of animal fat and butter. In 1907, the use of barite was strongly criticised by the French who stopped importing Gorgonzola for several years, provoking the so-called “Barite war”. The problem was the significant tare represented by barite (having a high specific weight), as well as the health aspects of this treatment. The Ministry of Agriculture, Industry and Commerce appointed a commission that would respond to the French accusations. The assessment showed that the percentage of barite used was actually too high, and the mineral was replaced with more suitable matters. The Italian Committee of the International Dairy Federation went even further and in 1909 suggested to abolish any type of plastering on the Gorgonzola. The producers complied with the suggestions of the dairy experts and started using silver foil to wrap the cheese. Nowadays this is still used but with two additional layers: an inner packaging with light wood vertical listels kept together by woven wicker, and an outer packaging with a bottom and a “lid”, also made of woven wicker. Today, the production process of Gorgonzola, which in 1996 became a product with protected designation of origin, still involves a lot of manual intervention, also at large national industry level. The cheese is produced exclusively with pasteurized full-fat cow milk added with milk enzymes, rennet and penicillin spores. After coagulation, the curd (approx. 15 kg per wheel) is put in wooden moulds and let rest in order to drain the serum. The wheels are then turned over and branded on both sides with the ID number of the cheese factory. Afterwards, they are moved to cells, called “purgatory”, with a temperature of 18/24 °C, where the wheels are manually salted. After about 3 weeks of ripening, in cold stores at 2/7 °C, with 85/99% humidity, the wheels are punched with large metal needles to let the air enter in the cheese, develop the cultures inserted in the curdle and hence give birth to the unique blue/green veins of Gorgonzola. Once ripening is completed, after about 2 months, the wheels are cut and each part is wrapped in silver foil marked with the unique G in relief of the Consortium, the only quality assurance where C indicates the Consortium and G refers to Gorgonzola cheese. Without the cheese factory number, the Consortium mark and the silver foil in relief, the cheese is not Gorgonzola PDO.